I love Christmas advent calendars, starting on the first of December, opening a little door each day, revealing a festive picture – or a chocolate 🙂 I thought I would do my own version of an advent calendar here! 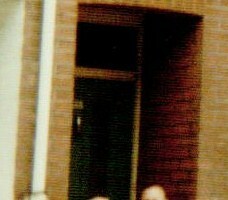 Every day I will post a picture of a tiny piece of a door from an old family photograph. The following day I will reveal where the door is and tell a little story about it. If only I was better at using the computer I might be able to have a ‘virtual’ door you could click on and open. Sadly, this is the best I can do! Tomorrow I will reveal where this door is! I hope the anticipation and excitement isn’t too much for you! This entry was posted in jackiedinnis and tagged Advent, advent calendar, Christmas, doors, front doors. Bookmark the permalink. Love this idea… And healthier than chocolate! And if you’re missing the chocolate you can always buy some to eat while you read the day’s Advent Calendar story!